I don't know about you, but whenever the weather starts to cool off a little I crave two things: soup and anything with pumpkin. 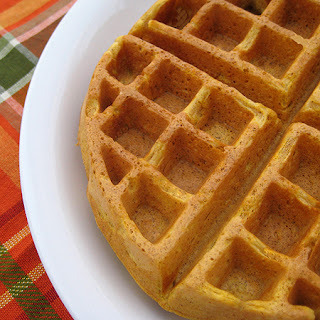 These waffles are perfect for a cool autumn morning. My family gobbled them up! 2. In a large bowl combine dry ingredients. 3. In a smaller bowl, beat wet ingredients. Add wet to dry and mix until incorporated. 4. Cook until crispy and golden brown. Serve with pure maple syrup.